The fact that Consciousness and Force are not aligned in the human being in the ideal denouement gives rise to three difficulties. The first difficulty arises from the structure of our being. We feel and act as if we are capable of great thoughts and mighty actions. But this is a chimera. Our surface personality does not represent our whole being. It neither represents the whole repertoire of our consciousness nor the whole potentiality of our Energy. In other words Consciousness and Force are imperfectly poised and not harmonized in our being. Actually our surface personality is a small part of our being which has been propped up by the subconscious (the Freudian Unconscious) below and the subliminal behind which in turn is connected with the cosmic consciousness (a part of which projects the Jungian collective unconscious). Our surface personality revolving round the ego is only a limited field of operation for we are actually controlled and governed, rather unknowingly by the subconscient and the subliminal. 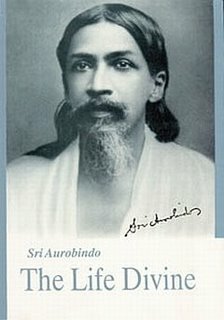 (The Life Divine, pg 226) The dissonance between Consciousness and Force accentuates the difficulty of self-governance. Unless we are identified with our whole existence, we cannot govern ourselves with self-mastery and self-direction. We therefore are deluded into thinking that we are independent subjects acting in accordance with free-will. Rather we are victims of circumstances, compelled to follow the forces of Nature rather than the dictates of a higher or deeper consciousness. But Nature as we initially perceive acts on our surface personality that revolves around the ego and is an inverted representation of the creative force of consciousness in the depths of our being. This poise of Nature (also known as the lower Nature) does not represent truth but is rather ‘an illusion-power’ (Ibid, pg 227) or Maya of the Lord. It is not harmonious but chaotic and does not follow any consistent law of action. To discover the roots of one’s consciousness and power, the individual has to go to the depths behind the surface personality. This inner sojourn can lead to three directions. It can plunge downwards into the Inconscience which again is the denial of the Superconscience and cannot be profitable. One can also travel inwards where the Lord is seated in the centre of the being in the soul-space. Or else, it can soar upwards to the Superconscient. The Superconscient holds in itself the highest creative consciousness – the Supermind. The Supermind executes its action through a Higher Law which is constructive and creative and holds Consciousness and Force as interspersed powers. The Higher Law is ‘the higher and divine Maya’ serving the Higher ego-transcending poise of Nature. The Higher Maya is the ‘Truth-Power’ which perfectly synthesizes Consciousness and Force. The lower Maya is the ‘Illusion-Power’ and is a distorted projection of the ‘Truth-Power’ and thus cannot heal the dissonance of Consciousness and Force.